Last night, at the September meeting of the Open Geospatial Consortium (OGC) Technical Committee in Stuttgart, Germany, Joan Masó received the OGC’s prestigious Kenneth D. Gardels Award. 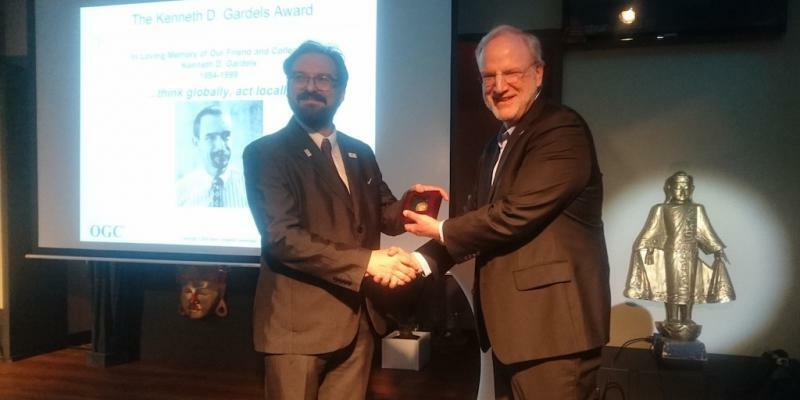 The Gardels Award is presented each year to an individual who has made an outstanding contribution to advancing OGC’s vision of fully integrating geospatial information into the world’s information systems. Joan Masó, from Universitat Autònoma de Barcelona (CREAF), was awarded for being ‘the hardest working OGC member out there.’ Joan chairs several working groups, is very active in the OGC Innovation Program, and always provides high-quality results across his work. His work on the Web Map Tile Service (WMTS) standard has proved invaluable, as this standard is one of the most widely adopted standards in the geospatial community.